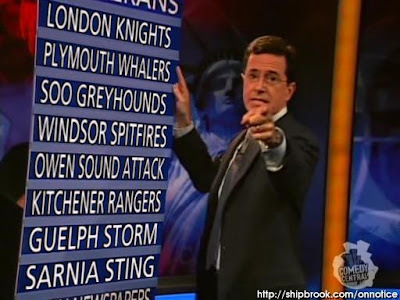 Apparently on last night's edition of The Colbert Report, Stephen Colbert invited U.S. Speedskater Joey Cheek to help put "Canadian Iceholes" (a.k.a. "syrup suckers!") ON NOTICE in an on-air retaliation for limited access to training options at the Richmond Olympic Oval in Greater Vancouver. Though I missed the telecast, the online clip tells the tale and is punctuated by one rendition of the Canadian "national anthem" that brought down the house. Fun to see Colbert donning Cheek's gold medal from Torino.